Credit Union Backup is a key part of any disaster recovery solution. DR is what we do; we have numerous methods of providing secure data backup at a site geographically separate from our clients’ primary business locations. Whether you are considering a Cloud based backup solution or a more traditional means to move your data offsite, you data still ends up protected and available for your use in the event of a disaster. As with all disaster recovery and business continuity service providers, there is a sliding scale that dictates cost will increase as recovery time objectives (RTO) and recovery point objectives (RPO) become smaller/shorter. The important thing is to decide on a method that will satisfy your organization’s DR goals and fit within your budget. While a full Cloud-based solution results in hardware and data being completely removed from the primary business site, there are also additional options. While our Replicator utilizes traditional appliance based backup and replication services on the client side, the solution also utilizes the full power of our community cloud on the back end. If you are ready to go head first into the cloud with us or just looking for some co-location rackspace to store your DR hardware, OGO has a solution to help offsite your data. 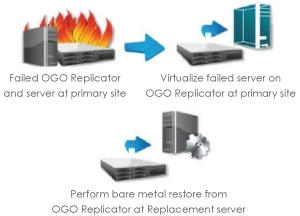 Want to see how the Replicator matches up to other Offsite Data Vaulting Products? Would you like to learn how to size and scope your bandwidth requirements for offsite backups? Are there Benefits to Migrating to Office 365 for Credit Unions?